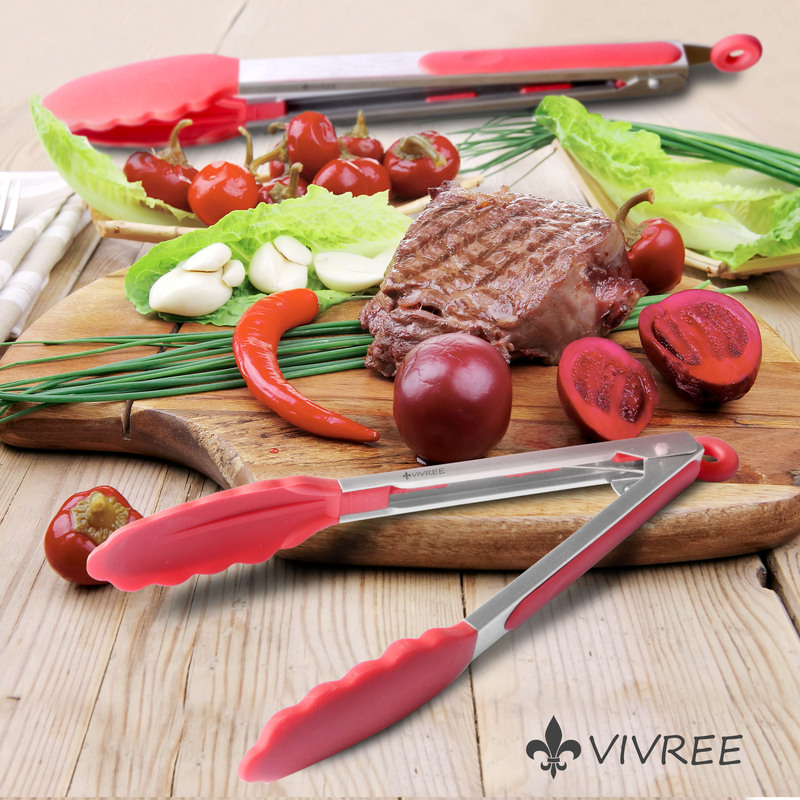 I just love these silicone tongs from Vivree. I love to cook and grill and these tongs are an awesome accessory for the kitchen. This is a set of two you get a smaller and larger pair of kitchen tongs. They are made of stainless steel which makes them really sturdy and they won’t break. However the tips and handle are covered in high quality silicone. Silicone is a new trend in the kitchen but it withstands really high temperatures and it’s non-stick so it makes it perfect for kitchen tools. These work really well. you can easily pick up items with them and move them around. I use these in the house and on the grill all the time. Another feature I love is the locking mechanism. Pull up on the round hanger on the end and it locks the tons closed. You can also use this to hang the tongs, I keep mine hung next to the stove. Great set of cooking tongs! Premium Tuner Tongs – These High Quality Turner Tongs with 100% FDA grade BPA free silicone tips provide greater safety and protect you against contaminating foods. Ideal Kitchen Tongs for a variety of foods, including serving and cooking foods such as salad, grilled foods, pastas, fruits and much more. Equipped with a new Pull-Ring technology keeping them from opening and closing at the wrong time facilitating control while using them making them easy to use and allowing storage with other Kitchen utensils. Heat Resistant and Non-Removable Silicone Tips – Superior Quality Silicone Tongs are completely heat resistant to 480ºF, giving you peace of mind that the silicone will not melt and contaminate the food. 403 Stainless Steel Handles – Ergonomic Handles with soft pads allow safe handling of food without the risk of them bending, breaking or rusting. Dishwasher safe facilitating your day-to-day to give you easy cleaning. 100% Guarantee – If you have any problems FOR THE LIFETIME OF THE PRODUCT, we will refund your order in full PLUS supply a new item. Add to cart now because you literally risk nothing. You can purchase these tongs on Amazon!